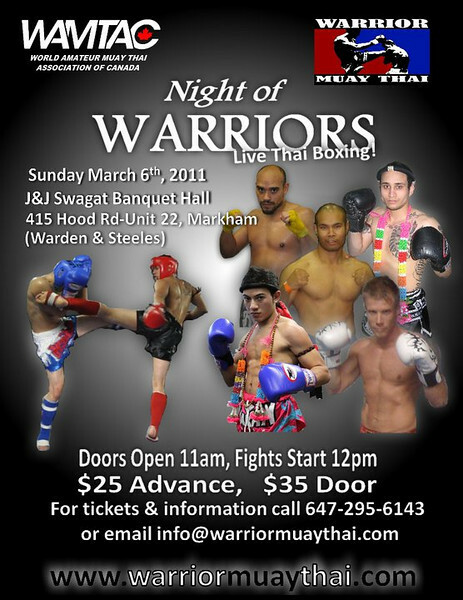 A lineup has been together for the rapidly approaching March 6th, 2011 card coming from World Amateur Muay Thai Association of Canada (WAMTAC). It looks like participation is going to be good and another important step towards developing the amateur fighters of Toronto and Ontario has been taken despite the CMTC-A party line that a Provincial Sport Organization must be place. Also it is important to make a clarification that this is not WAMTAC’s first sanction event, it is in fact WAMTAC’s 5th event, it’s 4th event in the Province of Ontario (the 1st was in the province of PEI) and the 1st in the city of Toronto, which is the largest and most densly populated city of Canada both in terms of general population as well as Muay Thai schools. Due to WAMTAC’s research and not an insignificant amount of litigation Ontario can in fact hold Muay Thai bouts and begin building their own future in the sport of Muay Thai. Tickets are also available via the Warrior Muay Thai website.